MiniPo Theme is Modern, Unique, Creative and Designed With a Clean Layout and Elegant Touch. That’s made an Eye-catching and Different Perspective view for your website. That helps you to build your portfolio and make an Impression on Thousand of Crowd. There are Total 52+ Html Pages, 8+ Home Page, 25 Portfolio Pages, 12 Blog Page in Different Style. 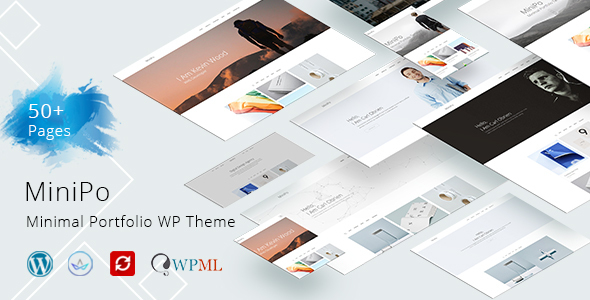 This Theme is built with world most Popular CSS Framework Bootstrap 3.x, html5, css3, jQuey, and many Modern Technology Features. This Theme is created and Tasted all Device and Browser like as FireFox, Chrome, Internet Explorer, and Perfect for any Issue. Also validated for W3C. MiniPo Contact form dynamically Working with Ajax and Google Maps Included because we try to giving client satisfaction and priority.